Home / Opinion / Interviews / Text Interviews / Biff Byford, Saxon, Interview. 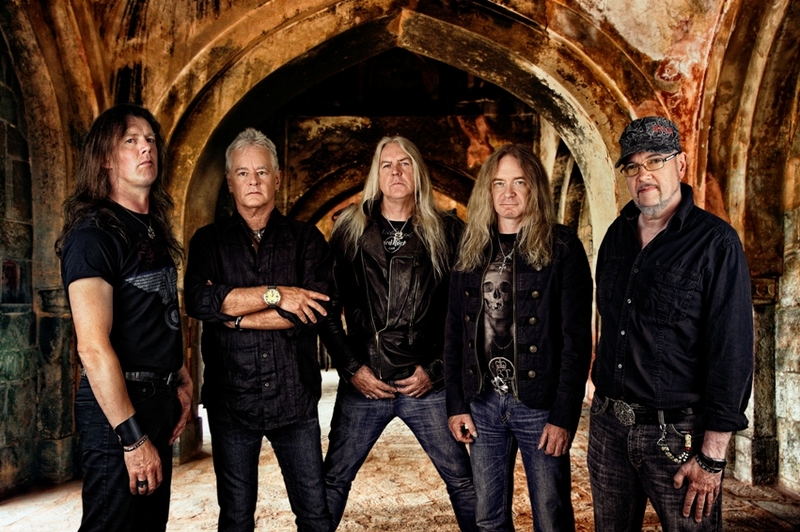 After twenty albums Saxon still have the ability to rejuvenate their talent and direction. As we all know Saxon have had their fair share of high and lows, and with their latest album ‘Sacrifice’, they have proven again to the modernism people of the metal world, Saxon are still soaring high. In the interview, I wanted to capture that essence of early working class life and the truth of what it’s like to be in one of the most successful NWOBHM bands, and to gain an understanding of how much our roots effect the actions and career paths we take. ‘Dogs Of War’ is being released on special edition picture disc vinyl. It is an album that was originally delivered during the dark time for NWOBHM as grunge was at it’s pinnacle. Saxon tackle it with their heaviest album yet, a cover that’s fixated in the minds of their fans and Saxon’s pursuit. It was a challenging time for the bands progression and mainstay guitarist Graham Oliver to split from the band he founded back in 1976. Lara- Why ‘Dogs Of War’ album – do you have any personal attachment to this album, as it was recorded in Boston back in 1995, an old Yorkshire mining town much like Barnsley? Biff- Well it was the first of the heavier albums song wise and it was Oliver’s last album it was written in Boston but recorded in Manchester and Hamburg. It was a difficult time for the band as I was trying to bring back a more anthem -ed style of song writing. Lara- Saxon are very much a hard working band with a strong work ethic. Does a working class environment get the best out of you guys considering you have recorded a few albums in Boston and yourself growing up in a sleepy village such as Honley? Biff- Well we are a working class bunch of guys and we have never stopped I am a country boy at heart so but it’s the love of the music that drives you. Lara- Saxon have only just released ‘Sacrifice’. Surely the focus would be on the just released album that has been so successful- ‘Sacrifice’ took a heavier turn compared to ‘Call to Arms’. ‘Dogs Of War’ was your album noted for being more aggressive and notorious for the album artwork and riffs, especially in the album title track- does that have any relevance in the re-release? Lara- Over the years there has been experiments with different styles in your music but still keeping to that true hard rock sound that Saxon has. In the album ‘Dogs of War’ and looking at ‘Sacrifice’ there is changes to the delivery of vocals, ‘DOW’ a more quiet softer touch and ‘Sacrifice’ an aggressive and visceral feel. Do you feel you still have to prove yourself as a vocalist? Biff- ‘Dogs Of War’ was produced by the same guy who produced ‘Solid Ball Of Rock’so the sound is friendly. ‘Sacrifice’ was produced by me and mixed by Andy Sneap so it had a much more aggressive feel. I don’t really think about if I am a good vocalist… I leave that up to fans and critics! Lara- Going way back when you were an aspiring vocalist, was it tough to be taken seriously coming from Barnsley, what techniques and styles did you look upon when defining your own style? Biff- I think it’s tough wherever you’re from when you are an unknown band. Our early style was Blues Rock with a Prog influence but with a bit of Led Zep, Sabbath iand Wishbone Ash in there. Lara- Saxon are one of the longest NWOBHM bands going. How do you feel about the current metal scene and who do you feel will be the successors to the throne? Biff- Well I suppose Saxon and Maiden are the more successful of those times. I think the scene at the moment is wide open for some bands to come along and take the Throne. Lara- As a band that has just released their twentieth album, do you feel there is much legitimacy in the music industry or do you think the days of bands having careers that span twenty albums are over? Biff- I think it’s all changed with digital technology these days. You have to embrace it but keep an eye on the past. I think bands can still have long careers. Lara- Thank you Biff for your time.